On December 17, 1776, the Fifth Provincial Congress at Halifax issued the North Carolina Declaration of Rights. 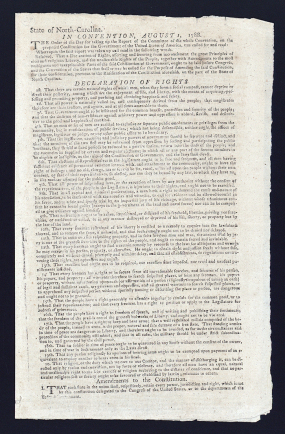 Consisting of 25 articles, the document outlined the basic rights of citizens of the new state and became part of the state constitution, which was issued the following day. barred the creation of laws with retroactive penalties. Notably at the time, these rights applied to free people only, and not to slaves. In an ironic twist, the citizens of the state did not vote on either the Declaration of Rights or the new constitution. Instead, they went into effect on the authority of the congress.